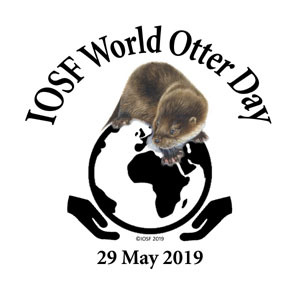 IOSF has been celebrating otters annually and raising awareness about their importance in our environment for 10 years now, and 2019 will be IOSF World Otter Day's fifth year. Each year more people in more countries are getting involved and in 2018 World Otter Day was celebrated in at least 26 countries. 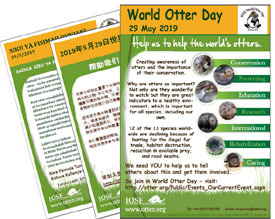 Wednesday 29 May brings the opportunity for you to join the many people from around the world, who love otters and are dedicated to their conservation, to raise awareness and ensure that a greater number of people know about the problems that otters face. The loss of habitat, illegal trade (fur and pets), being hunted, road death, pollution are a few of the challenges. All 13 species of otter need our help. ALL 13 species are listed in the IUCN Red List. WE ARE THEIR VOICE! We must spread the word and encourage others to become involved and aware of the situation for otters in the environment and the delicate balance of their survival. You can start NOW by using #worldotterday in all your social media, and on the 29 MAY, let all your 'friends/followers' know and get them to share too. Let us make otters BIG NEWS and get #worldotterday trending. We also need funds to help support people working in otter conservation and caring for individual orphaned and injured otters. 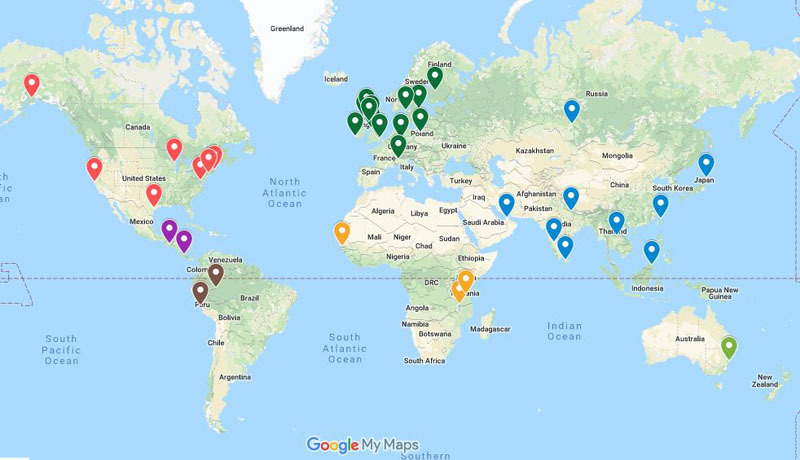 Don’t forget to tell us about your plans (enquiries@otter.org) and if you are organising an event we will include it on our world map, events page and social media. Click on this image to view our World Map for World Otter Day events and keep up-to-date with what is happening. One of the ways you can support this is to join in our raffle. Tickets cost just £5 each and are available from Grace’s JustGiving fundraising page. Make sure before you confirm your donation, that you tick the box alongside "I'm happy to be contacted by Grace Yoxon ". 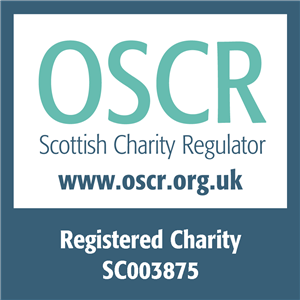 Justgiving can then share your contact details with us and we can issue you with a ticket number. The last entries will be accepted on June 5th 2019 and the draw will take place on June 6th 2019. All winners will be notified by email. 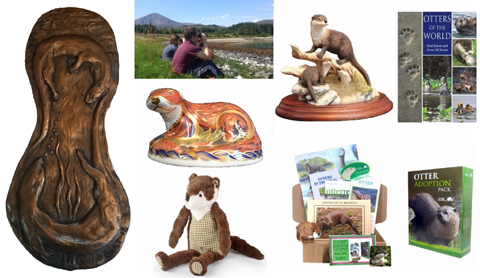 This year IOSF was again able to offer three £100 grants towards the cost of putting on an event or carrying out education work, as part of a World Otter Day event. Again, we have received many applications from around the world for interesting an varied projects. We want to thank everyone who submitted an application and appreciate their support. - Leona Wai, Danau Girang Field Centre (DGFC), Malaysia who is planning to a human-otter conflict workshop with the fishermen in Batu Puteh, Kinabatangan, Sabah, Borneo, Malaysia. - Ana Maria Montes Ferro, Natural Reserve and Research Facility, Palmarí, Javary Basin of the Brazilian amazon, will be organising a celebration of the Giant Otter and the Neotropical Otter for the World Otters’ Day with local children. - Karanta Camara, Bird Watchers Association The Gambia - will be working with rural communities and fishermen to gain their observations and records of otters in the creeks of the Boabolong Wetland area. We also received an anonymous donation of a further £100 kindly given as a fourth grant, and this has been awarded to - Kiengkai Khoonsrivong from Lao PDR - who will be raising awarness of the fur and pet trade and promoting otter conservation to students and local communities.